A few days ago Jason posted the new labels for ZP use on grasses grown for seed. We now have a label for ZP Ag Pellets for vole control in "clover grown for seed, forage or hay; clover/grass mixtures; and pasture." This label is for year around use but is legal for below ground, hand baiting only. Here is a link to the label. ZP use clover is only approved in Oregon and this label is valid until December 31, 2014, unless otherwise suspended or amended by ODA. Clover fields have had a tendency to develop a serious vole problem in the past. Now that zinc-phosphide pellets are a legal option we can stay ahead of the voles. Talk with your CPS fieldman about the use of ZP for vole control. We are quickly approaching optimal timing for Nut Chaser in filberts. Nut Chaser is a foliar fertilizer blend of micronutrients developed by Joe Cacka, CPS agronomist for the Cascade/Columbia division. Joe's research has shown that a mid-May application followed by a mid-June application gave the highest and most consistent bump in yield and kernel quality. 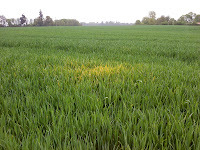 Nut Chaser is also compatible with all fungicides and insecticides so a special trip across the field is not necessary. Here is a link to the sheet summarizing three years of research trials and here's a sheet showing yield data as well as the importance of calcium and boron in nut production. The Nut Chaser label shows recommended rates and the product analysis. Talk with your CPS fieldman about Nut Chaser rates and timing. Wanted to give everybody an update on the Zinc Phosphide Label for above ground use in grass seed. We received word from Michael Babbitt at ODA, that ODA and USFW had made a decision to allow the application of ZP above ground use to begin May 1st through August 31st. Last year ODA did not allow the above ground use until May 8th, because of the few geese that were hanging around late last year. To allow the use of ZP on May 1st they made some changes to the label which is address in the text below. This is part of the letter that was sent from ODA to EPA. After much debating about the first date of when the application of zinc phosphide above-ground on grass grown for seed should be allowed, it was decided that because it is an El Nino year and the grass is becoming very tall, that the start up date should be May 1. The label states, "APPLICATIONS ARE ONLY ALLOWED FROM MAY 1 THROUGH AUGUST 31". Please note, any above-ground application of zinc phosphide to grass grown for seed prior to May 1 would be considered a serious violation. Also, because of concerns expressed by United States Fish and Wildlife Service, the following statement, "Do not make applications if geese or other migratory birds have been observed in the field within the last seven (7) days", has been changed to, "Do not make applications if geese or other migratory birds have been observed in the field within the last fourteen (14) days". Again wanted point out the label change went from no migratory birds or geese seen in the last 7 days to 14 days now. Below are the links to the 2 different labels. Last week I attended a meeting Tuesday evening hosted by the Linn County Soil and Water Conservation District concerning goose depredation on crops here in the Valley. There were several people from the government agencies responsible for monitoring and maintaining the goose population present at the meeting. The time was set aside to give growers a chance to voice concerns about goose damage to their crops. 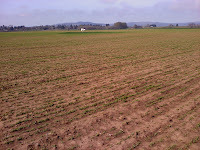 Goose damage to winter wheat. Picture taken 23 Mar 2010. There is no doubt that goose pressure on our crops is becoming a greater concern here. With government mandates through the International Migratory Bird Treaty to increase the total goose population by nearly 100,000 birds and the increasing acres that are going into the Wetland Reserve Program it is likely to get much worse. One issue that was brought up is that the amount of food plot acreage on WRP ground is restricted by law to 5%. This would mean that a 300 acre wetland would only be allowed to provide 15 acres of feed. There were not a lot of helpful answers regarding crop losses to growers. There is however an ODFW Goose Control Task Force that was formed to give growers and landowners an official, political voice on this matter. It was mentioned several times by the government officials present at the meeting that they "had no political clout" when it came to voicing grower's concerns but that "we" as growers and landowners and private citizens do. 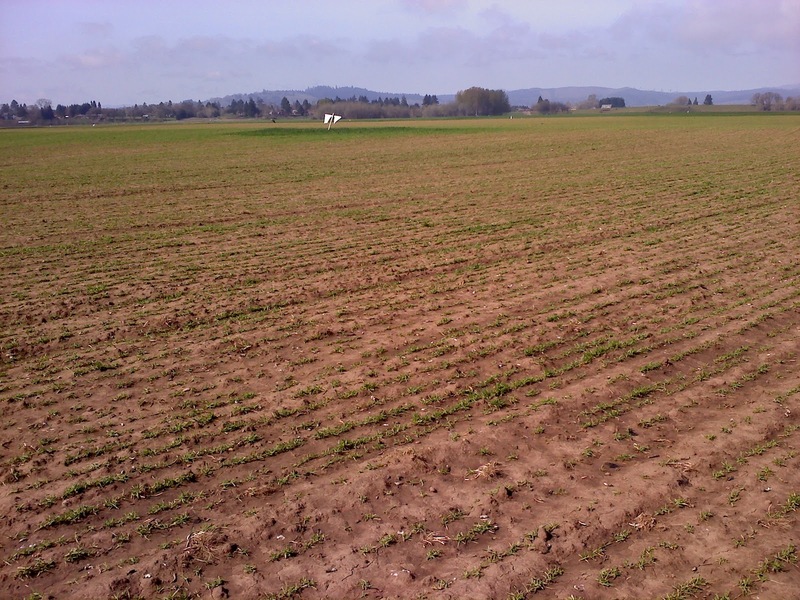 Crop depredation by geese in the Willamette Valley will only increase as a greater percentage of the migratory population makes this Valley their winter home and not just a pit stop. So how do we as an industry and local economy deal with a problem that, by definition, could be viewed by growers as an invasive species? The geese have not historically congregated here in such numbers and certainly cause significant economic damage. With so many wetlands being developed all over the Valley there are new local flyways being created that are bringing larger populations of geese into new areas resulting in crop damage to fields that have not historically had a problem. 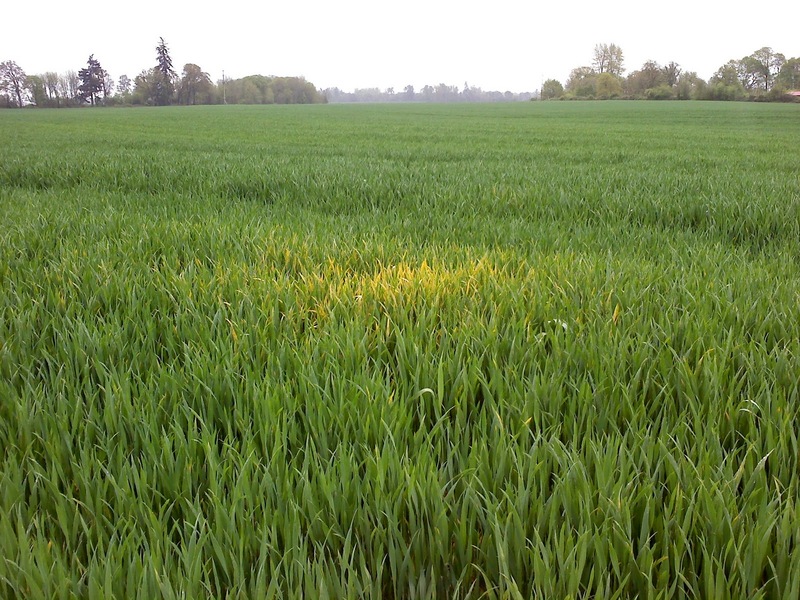 At this point I think it is important for growers to begin gathering some evidence of goose damage on your fields. 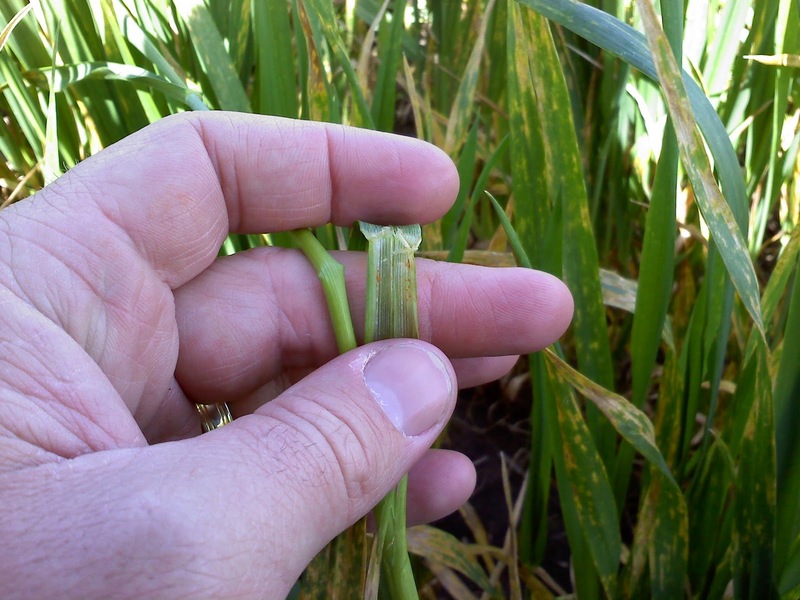 Take some pictures of damaged crops or total stand loss and put some actual dollar costs to it. Contact the Goose Control Task Force and voice your concerns about crop damage and the costs of protecting your crop. Regulations almost always trend towards more restrictions and it is much easier to affect regulations before they are set in stone but it will take a loud concerted effort by growers to get our concerns heard. For your convenience I'm listing the government officials that attended the meeting with their contact information. These folks should be able to answer your questions and hear your concerns. 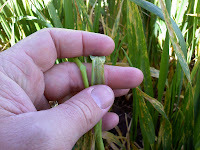 A few weeks ago I posted a picture and short article about Joe Cacka setting up a research trial to gather data to back a Palisade label on wheat. 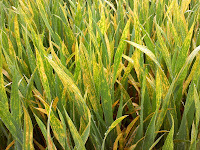 Syngenta is applying for a Section 3 federal label for Palisade that may be approved in 2011 or 2012. We have also been waiting with bated breath to hear back from EPA regarding a Section 18 Emergency Exemption request for Palisade on wheat in Oregon for the 2010 growing season. EPA has denied it. I am posting the complete response from EPA below and I'll let you read it for yourself. If you have any concerns or opinions you can contact Anthony Britten of EPA directly by clicking his name below. basically a tightened-up version of what I sent you on 3/30. able to document that there is an "urgent and non-routine event"
- 10,000 acres of "x" has been in production for several years in "x"
- The avg harvest has been 100 bushels an acre. use on more than just those affected acres. yields compared to a typical growing season. event unless they are tied to a very unusual weather pattern. didn't look especially high to our economists. See link/attachment. in 2003 and going back as far as 1912.
historical acres, yields, revenues for certain commodities. HED could make a safety finding decision in time for the use season. Again, I regret I'm not the bearer of better news. grain exceed the actual direct crop loss. market price for US# 1 and #2 wheat. In these numbers I see a potential loss of $554/acre not including the added risk of losing an entire crop to weather because it takes so much longer to harvest. I guess EPA does not find that loss to be significant enough to "find a path" to move forward with the Palisade section 18. I got a call today from Ross Penhallegon, Lane County OSU Extension Horticulture Agent, giving us a heads up to severe Brown Rot Blossom Blight in cherries this year. More brown rot blossom blight on cherry trees out on our experiment farm (in Corvallis) than I have ever seen in 22 years. Trees have anywhere from 50 to 90% of the blossoms blighted where there has been no fungicide application. We don't have a lot of cherries in this part of the Valley, relative to our other crops, but this information is crucial for cherry producers. 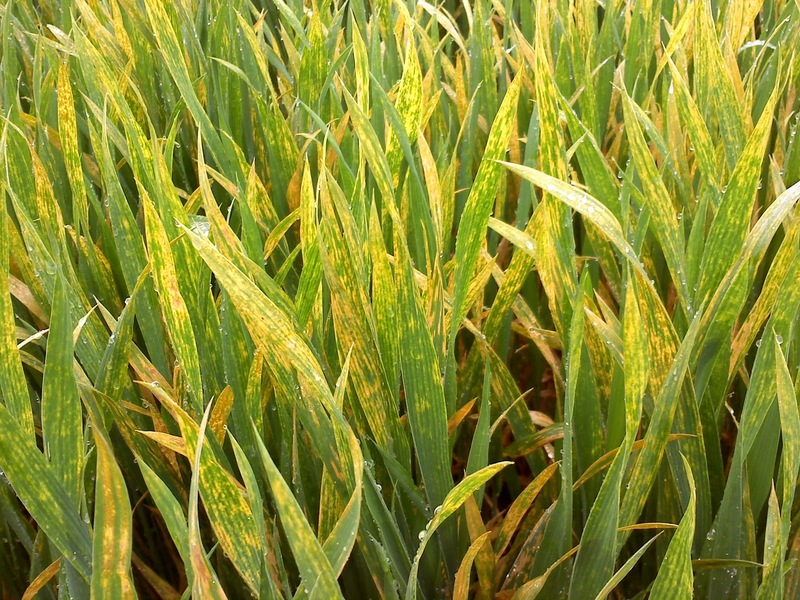 This is not the year to skimp on your fungicide program! An insect pest that is becoming a very serious problem for fruit producers in the region is the Spotted Wing Drosophila, an invasive species of the fruit fly. The SWD has gotten a lot buzz lately due to how fast it has invaded fruit producing regions across the Western US; here is a map of its distribution in Oregon. The SWD completes its life cycle from egg to fertile adult in as little as a week in temperatures between 68 and 86 degrees. Adult females have the capacity to lay 350 eggs, only laying 1-3 eggs per fruit. Fortunately our temperatures tend to be on the low side for that development speed this time of year but it gives you an idea of how quickly this pest can take off. The SWD has been known to infest ripening cherry, raspberry, blackberry, blueberry, and strawberry crops; it has also been observed attacking other soft-flesh fruit such as boysenberry, varieties of Japanese plums, plumcots, and nectarines. Talk with your CPS fieldman if you have any questions about Brown Rot or Spotted Wing Drosophila. As many of you know, we are back to fumigating warehouses again. Since we have started fumigating with the new product "Profume" we are finding this process to be more labor intensive and requiring specialized training in these applications. Since our current sales & operational staff is quite busy, we have decided to look for a helper to assist our "chief fumigator", Ira Zipperer. This position will primarily be weekend work, that also spills over into the weekday. It is not full-time in nature, but the schedule is driven by demand and seasons. Ideally someone who is not looking for full-time work, but wanting something with limited hours would be ideal. Below is a description of what we need and credentials we would like that person to achieve. There is more information about the fumigation process here. Fumigation Applicator Trainee - Valid ODL reqd, prefer Class C CDL w/Haz Mat endorsement or willing to obtain. Applicant must be willing to obtain Oregon Commercial Pesticide Application license w/IIH Space Fumigation endorsement. Able to operate or learn to operate mobile laptop computer, monitoring and injection equipment, and train on proper and safe use of SCBA equipment. Seal and prepare seed and grain warehouses for fumigation of rodents and other pests. Willing to climb ladders and work out of a man cage to plug holes in building. Experience in forklift operation. Basic math skills for calculating cubic feet in a building. Basic mechanical skills to operate simple hand tools and power tools (drill, circular saw, etc). Able to drive a one ton truck pulling a 14' cargo trailer with placarded fumigant. Ability to handle 200# cylinders with aid of others or lifting mechanisms. Candidate must pass both a pre-employment drug screen and criminal background check. This is primarily a weekend position and will be ongoing. If you know of anyone who might be interested in this position have them call Curt Dannen at the Tangent Branch 541-928-3391.